Hale Stewart’s Holiday Sales are Strongest in Years points out that real Personal Consumption Expenditures (PCEs) grew for the second half of 2010. His article made me wonder how much of the increase in real PCEs was related to population growth, vs. the extent to which consumption was growing per capita, which is a better measure of how economically better off the average Amercan consumer is in an Adam Smith sense. 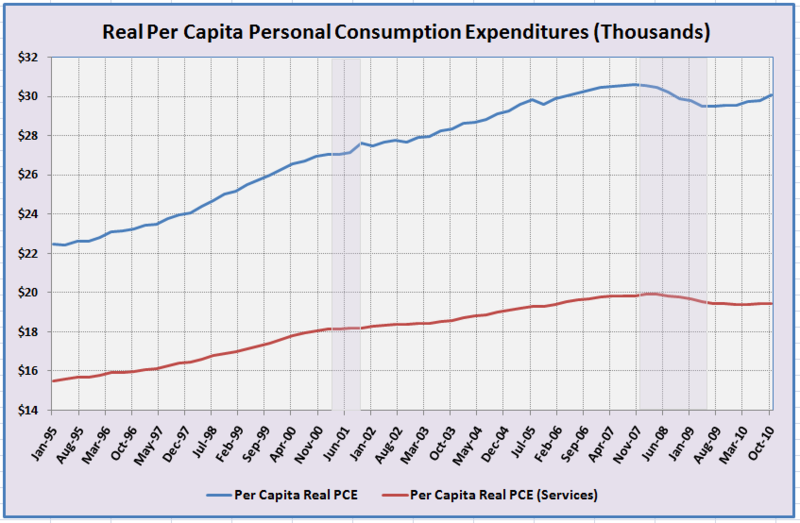 I therefore deflated real PCEs and real PCEs for Services by the Total US Population and graphed the results below (with recessionary periods shaded). Per capita PCEs have been increasing during the recovery, although per capita PCEs on services are largely flat. Neither series has fully bounced back to its pre-recession level. 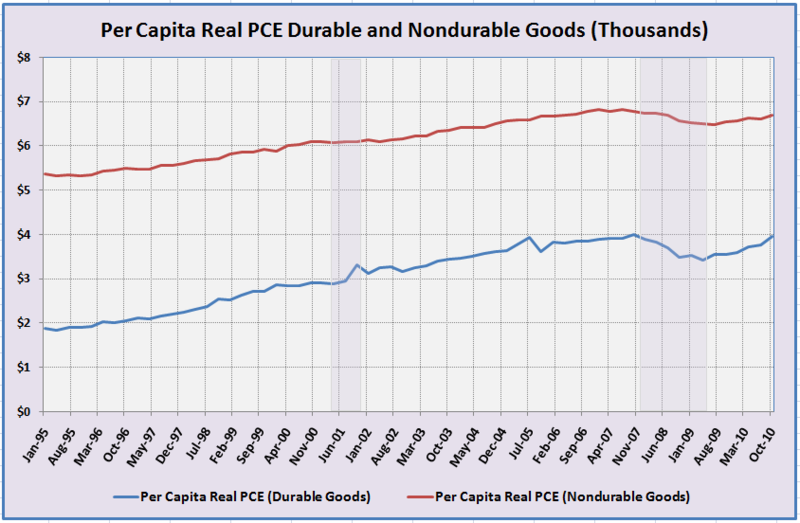 The chart below shows that real per capita PCEs on durable and nondurable goods are also increasing, and are already back to their pre-recession levels, however. Summary: Real per capita spending on durable and nondurable goods is increasing, although real per capita spending on services is still lagging. Sales at upscale retailers are bouncing back faster than in the previous recovery, while sales at Target and Wal-Mart are expected to grow less than one percent in 2010.